I can’t believe Easter is coming up in a little over a week! If you’re anything like me, you’ve already got your whole menu planned out at least a week in advance. 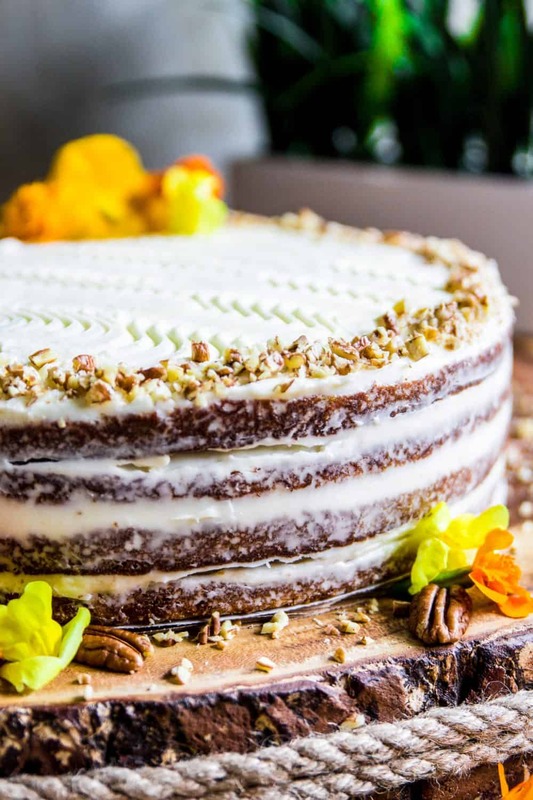 Whether you’re hosting a family gathering or bringing something sweet to a pot luck, this carrot cake will not disappoint. Each cake layer is loaded with carrots (obviously) chopped pecans, coconut flakes, and crushed pineapple. The crushed pineapple makes it super rich and moist. Although the cake is usually the star of the show, the frosting plays a big role too. This frosting is a delicious combination of cream cheese, butter, sweetened condensed milk, and powdered sugar. It’s simplicity excellently complements the hearty cake. 1 . Sift the flour, baking soda, baking powder, salt, cinnamon and nutmeg. Then set aside. 2 . In the bowl of a stand mixer beat the eggs on high speed until light and fluffy (about 4 mins). Then add the white and brown sugar. 3 . Continue beating on high speed for an additional 4-5 minutes as you add melted butter and vanilla. 4 . Slow the speed down to medium low and add the crushed pineapple. 5 . Then slowly add the flour and spice mixture. 6 . Lastly, add the shredded carrot, chopped pecans, and coconut flakes. Mix on medium speed until all ingredients are well incorporated. 7 . Line 2 (10 inch) round baking pans with parchment paper and spray them with nonstick spray. Then evenly divide the batter between the two prepared cake pans. Bake at 350 degrees Fahrenheit for 30 minutes or until a toothpick comes out clean when inserted into the center of the cake. Once they’re done, remove them from the oven and transfer them to cooling racks. 8 . 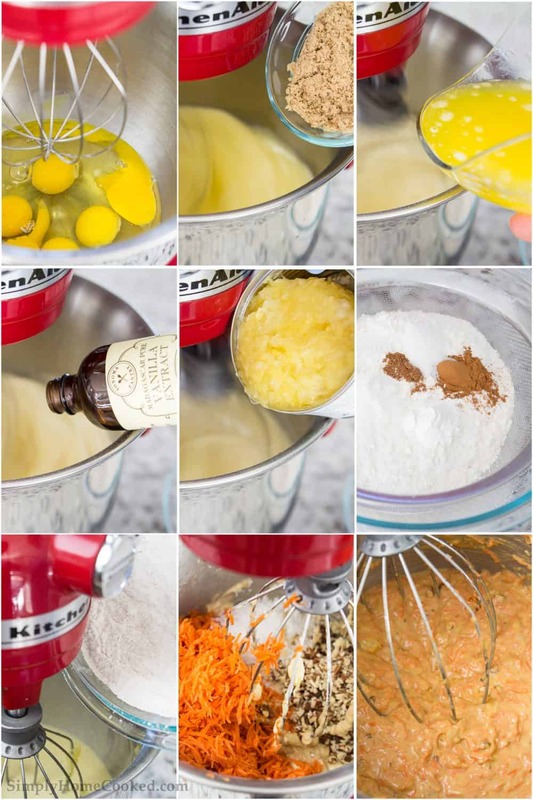 To make the frosting, in the bowl of a stand mixer, combine the softened cream cheese, butter, sweetened condensed milk, and powdered sugar using the whisk attachment. Start off on low speed so the powdered sugar doesn’t go flying everywhere. Then bring the speed to high and beat until the frosting becomes a smooth consistency. 9 . Once the cake has cooled, slice each layer into halves so you will end up with 4 separate layers. Assemble the carrot cake by distributing the frosting amongst the 4 layers. Make sure to leave some for the outside of the cake. Sift the flour, baking soda, baking powder, salt, cinnamon and nutmeg. Then set aside. In the bowl of a stand mixer beat the eggs on high speed until light and fluffy (about 4 mins). Then add the white and brown sugar. Continue beating on high speed for an additional 4-5 minutes as you add melted butter and vanilla. Slow the speed down to medium low and add the crushed pineapple. Then slowly add the flour and spice mixture. Lastly, add the shredded carrot, chopped pecans, and coconut flakes. Mix on medium speed until all ingredients are well incorporated. Line 2 (10 inch) round baking pans with parchment paper and spray them with nonstick spray. Then evenly divide the batter between the two prepared cake pans. Bake at 350 degrees Fahrenheit for 30 minutes or until a toothpick comes out clean when inserted into the center of the cake. Once they’re done, remove them from the oven and transfer them to cooling racks. 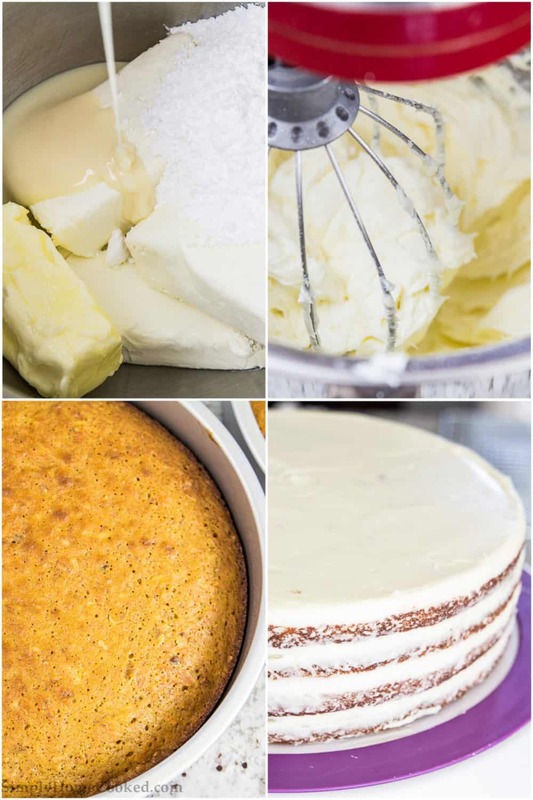 To make the frosting, in the bowl of a stand mixer, combine the softened cream cheese, butter, sweetened condensed milk, and powdered sugar using the whisk attachment. Start off on low speed so the powdered sugar doesn’t go flying everywhere. Then bring the speed to high and beat until the frosting becomes a smooth consistency. Once the cake has cooled, slice each layer into halves so you will end up with 4 separate layers. Assemble the carrot cake by distributing the frosting amongst the 4 layers. Make sure to leave some for the outside of the cake. This cake looks so moist and delicious! I love cakes that have more layers than just two. It makes them that much more prettier! I couldn’t agree more Katy. I love layered cakes because each bite has a perfect combination of everything that way. Thank you so much Albert! You are so kind. This looks delicious! This gets me super hungry for some carrot cake! Perfect for Easter! 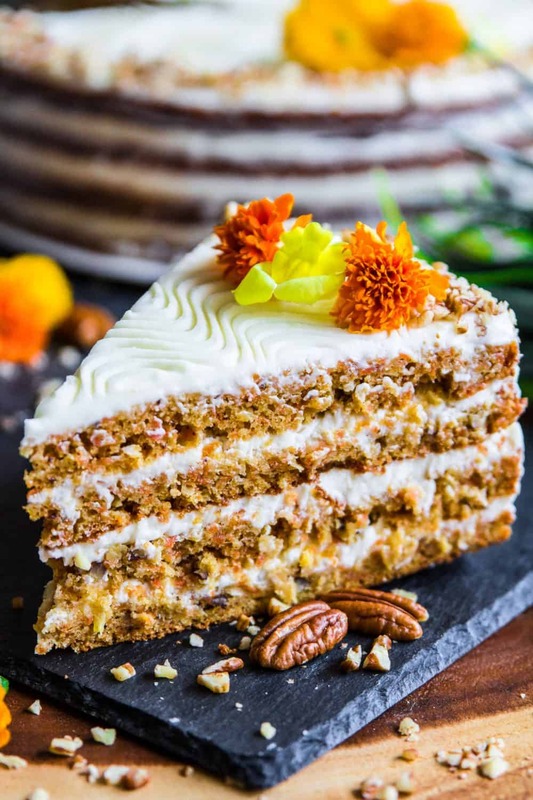 Your layered carrot cake is so beautifully decorated, great job!